If you haven’t heard, Disney’s Frozen is a huge success. It has grossed over $1 billion and now you can wait for 5 hours in the Florida sun to ride through it at Epcot. Kids love it and adults sing along to it on the radio. Frozen is a smash, plain and simple. And yet, it shouldn’t work. Something about it has bothered me from my first viewing. As the film carried on, I had a nagging feeling that Frozen was an inferior movie as a member of Disney canon. It was missing key details and ignoring others. Yet upon leaving the theater, I entered a world where Frozen was a new classic, a feminist triumph, an epic achievement, and on and on. But the film I saw didn’t work. Musical numbers and comic relief took the place of story mechanics, which the film fails to properly use. For all the love it gets, Frozen should not work. To “thaw” the masses who adore this film, here are 4 reasons why Frozen is, in the end, a failure in story-telling. This establishes the premise for the whole film. Elsa is a threat with her uncontrollable ice powers. Her parents lock her in a bedroom for the entirety of her childhood and teach her to be an emotionless recluse. She has some rather traumatizing issues to work out in the next hour-and-a-half. Yet the causality of these events is frustratingly thin. Too many questions abound. Why couldn’t the filmmakers have spent an extra 30-seconds explaining a few key issues, such as these? Did the King and Queen, and the people of Arandelle, know that baby Elsa had ice powers? Or did they keep that a secret for 2-3 years anyway? What is the source of Elsa’s magic? It could go along way towards amplifying the fear of those around her. If they can explain Rapunzel’s magic hair, they can explain Elsa’s ice powers. Why do the trolls insist on erasing Anna’s memory? The only purpose this seems to serve is to alienate Elsa, confuse Anna, and make the family’s life even harder than it would be by loving Elsa in the first place. The logic here is really fuzzy. How does the family handle Elsa’s growth? Does she seriously never leave her room? And if not, what’s going on out there in Arandelle? The people know positively nothing about Elsa except that she is supposed to be the next queen. And why so much excitement for a Coronation Day for a queen they know nothing about? When the King and Queen die, who rules in their stead? Why are the castle doors always locked? If Elsa stays in her room, why not maintain an image that everything is just fine? Some of these questions may be nit-picky, but they’re the kind of questions that appear when a story doesn’t do its job. Just ten minutes into the film, I’m confused as to why all this is happening in the first place. The premise is enough to get us into the rest of the movie, but it creates deep chasms in the character’s motivation – and, in my opinion, it makes the opening song an annoying substitution for solid exposition. Rather than showing us these characters and their motivations in this world, we get a pop song where Anna hops and skips through an empty castle, telling us why she’s excited. Unfortunately, songs sell tickets, so they will continue to occupy Disney productions until the end of time. But Disney could really use a lesson from its adopted brother, Pixar, about how to tell a story that leaves no holes. Seriously, which is more complicated: the beginning of Frozen, or the beginning of WALL-E? The world of WALL-E is infinitely more complicated, and yet Pixar pulls it off without extensive dialogue or songs. Frozen is the first Disney feature-film to employ a female director. Seriously – it took them that long. And even then, Jennifer Lee only served as the film’s co-director with Chris Buck. This seems to mirror Pixar’s move with Brave, another story that abandoned traditional “love” narrative in place of a more interesting family dynamic, helmed by a female director. It’s an obvious move in the right direction for art, film, and stories. And Frozen takes a step in the same direction by focusing on the relationship between Anna and Elsa throughout. It’s worth noting that the original structure of the story, based on Hans Christian Anderson’s “The Snow Queen”, framed Elsa as a more traditional antagonist, in keeping with the story’s roots. Yet the song “Let It Go” was deemed far too “positive” for a villain to sing, so the story was retooled to explore the tenuous sisterhood of Anna and Elsa. As a male (and an only-child), there is little I can offer to interpret or appreciate the relationship between Anna and Elsa, except to praise its portrayal as deep and complex in ways that exceed any other sister relationship in animated film. Structurally, by refusing to cast Elsa simply as an antagonist, the filmmakers have acknowledged that life and relationship are far more nuanced than the archetypes we tend to employ in times of conflict. When Anna finally finds Elsa in her ice castle, their dialogue reveals the depth and passion of their connection – the loss of childhood innocence, the pain of separation, and hope for the future. Unfortunately, this depth only goes so far, and it is regrettably concentrated in Elsa. Played by Idina Menzel with fascinating vulnerability, Elsa constantly wavers on the edge of crisis. From her coronation up to her tragic climax, Elsa is a gripping personality in the story that gives it a tremendous heart. The goal, the journey, and the crisis are all bound to Elsa’s choices, wounds, and sacrifice. Anna, on the other hand, is shallow and forgettable. She is loudly immature, painfully naive, and surprisingly static for a leading lady. From a story-telling point of view, there is nothing wrong with beginning with such a protagonist – most heroes begin their journey as uninformed youngsters. But Anna doesn’t really learn anything in the movie. She hardly grows. Think of it in terms of growth represented by choices. Anna’s massive choice at the end of the story, the moment of crisis, is to take a deathblow for her sister. For her to have grown, Anna must not have been willing to do this at the film’s start. One would be hard-pressed to argue that she wouldn’t. Really, Anna’s growth is limited to the hard-earned disappointment of Hans’ betrayal. But the relationship with Hans, or Kristoff, isn’t the core of the story. Her relationship with Elsa is. And while Elsa learns a great deal about trust, faith, and love, Anna doesn’t seem to learn nearly so much. As an audience member, it’s disappointing to follow a character for two hours and see her hardly budge. Frozen’s ensemble of supporting actors is a stark contrast to its two starring ladies. In fact, every significant role in the film that is not Anna and Elsa is male. Love interests: Hans and Kristoff. Anthropomorphic and Animal companions: Sven, Olaf, and Marshmellow (the biggun created by Elsa). And who can forget the Duke of “Weasel-town” and Oaken, the owner of the Trading Post? With the exception of the rapidly-deceased queen, Anna and Elsa are the only relevant women in Arandelle. Now there is nothing inherently wrong with this choice. In fact, by eliminating any other female roles, the filmmakers were able to focus the story on the sisters and avoid any troublesome (and cliche) conflicts with other female characters. But it seems that by not stuffing their fairy-tale with female stereotypes, they have substituted similarly shallow male ones. Kristoff is the likable, down-to-earth commoner that every princess seems to fall in love with because of his good heart. The Duke of “Weasel-town” is a hokey parody of money-obsessed Europeans. While not a stereotype, Sven feels like Tangled’s Maximus the Horse on Ritalin. Sure, they’re both horses, but one can’t help feel some deja vu. The real issue with Frozen’s use of the male role come from Hans. Upon a second viewing of the film, one can find hardly any foreshadowing of his eventual turn to evil. It simply happens because, well, it happens. He gives a long-winded monologue about being 13th in line for his throne, but no one is really listening because everyone should be trying to figure out where this is coming from. He turns not because it is true to his character, but because the filmmakers needed him to. It’s worth noting that the makers of Frozen didn’t give the story a traditional antagonist. Executed well, this is a bold and worthy choice. But Hans’ turn seemed to betray that sentiment. 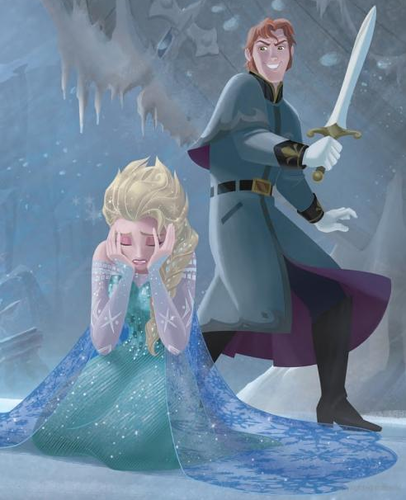 Frozen set us up to focus on Anna and Elsa’s conflict and reconciliation, yet Hans jerks the story back into Archetype Land where Evil is Evil and Good is Good. Not only is Hans a bit of a cheap-shot to win a few cries of “I didn’t see that coming!” – it’s a violation of the story’s commitment to a unique type of adventure where we all have the potential to be a hero or villain. For all of Frozen’s investment into the “truth” of sisterhood, it does little to establish and promote solid themes. This may not play into ones conscious enjoyment of the film, but it produces an everlasting blandness that reduces the film’s power. Most fantasies, even the more realistic ones, hinge on a theme or two that are the soul of the battle. Christopher Nolan reinvented a superhero franchise with Batman Begins, a story that lived and died by “fear”. Everything was linked to it. Bruce’s fear of bats led to his fear of failure. Gotham’s fear of criminals led to its fear of itself. And Batman’s fearlessness saved them all in the end. Yet Frozen’s themes seem to be more liquid than solid. In the end, Elsa learns that “love” thaws a frozen heart – a fine fairy-tale device, to be sure, but a weak means of teaching or learning a lesson. Where else in the story is “love” thematically important? The explosive romance between Hans and Anna seems to be about love, but it holds very little screen or script time. When Hans turns and reveals that he never really loved her, “love” is not the key theme – “trust” and “betrayal” are. If Hans loved another, or had a warped definition of love, this twist would work. But it doesn’t. Instead, it’s cold and confusing. The script uses frequent images such as “letting go” and “opening/shutting the door”. Are these expressions thematically rich, though? Doors are obvious symbols for opportunity, and here they are used in the context of the sisters’ relationship. Elsa stays behind closed doors all through their childhood, sequestering Anna both physically and emotionally. The castle’s doors have been shut for years. And Elsa powerfully “slams the door” to her ice castle at the end of “Let It Go,” symbolizing her isolation from the world and, by extension, her relationship with Anna. But what lesson is to be learned here? What lasting theme goes with the audience on its way out to the lobby? Open symbolic “doors” in our own lives? Close the bad ones? There is a difference between a symbol and a theme, in that symbols produce themes. 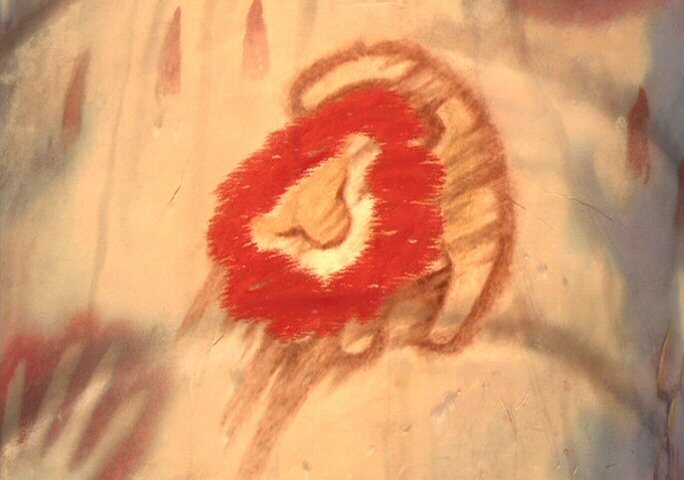 Rafiki’s baptism of Simba in The Lion King is a powerful, tear-jerking symbol – yet it isn’t the theme. The theme of that (superior) film is The True King. The baptism symbol supports this in so many ways, and so the moment when Rafiki cries “He is alive!” melts us because we know something that is universally true: There is hope for righteous leadership, after all. The True King will return! Frozen offers little to hope for, weep for, and cherish forever because it doesn’t mature beyond its individual pieces. Instead, we remember songs, scenes, and characters – but not lasting truths. A billion dollars doesn’t lie. DVD and Blu-ray sales alone will probably fill the crater left by John Carter and The Lone Ranger. The film still thrills with catchy, modern musical numbers and stunning art direction. Its attention to detail, especially regarding Scandinavian architecture and dress, makes it a visual spectacle. And Olaf simply steals his scenes and the comedy helps one forget that the film is missing crucial narrative elements. Explain Elsa’s powers – and the resulting fear in others – just a little more. All an audience needs to understand the most complex of worlds is a solid foundation. Give Anna more to learn and lose. Sure, she’s “a-dork-able”, but that isn’t enough for an audience to care. Give her stakes similar to Elsa (or just give Elsa more screen-time), and the story will be immediately more satisfying. Foreshadow Hans’ true motivation in a way that pays off. His twist is truly “out of left field”, causing more confusion than true shock. Muddy motivations lead to muddy stories. Clean up the themes and give Frozen something to say. Sure, it explores sisterhood better than most films out there, but it doesn’t really end up anywhere. What do you think? Should these details thaw all the love of Frozen out there? This post originally appeared at http://noahdavidwriter.com and is reblogged here with permission. Hi though your comments made me chuckle and yes I could see some points. As a lover of Frozen, I have an alternative viewpoint. I guess it must be where you are when you watch it! For me, I was at an all time low, and not only did the film ‘cheer me up’ but I identified themes within it which made sense to my faith forward stance. Watching one sister sacrifice her life for the sake of the other, lead me to think about another who gave his life for me – Jesus. Watching how betrayal kills made me think of my Lord, how love pushes out fear, took me back to the messages of the Bible. It was so powerful in fact, I used the metaphors of Frozen to write my own book Unfrozen: How to melt your heart from life’s disappointment, disillusionment and discouragement by opening the door and stepping into God’s warming light. Perhaps David, we are just two sides of the same coin? Arendelle currency of course! Well, my own heart is warmed by your wonderfully positive response to the film! That’s the great thing about story – it has the powerful to heal us. And while I’d love to think that Disney was trying to sneak a Christ-metaphor in with Anna sacrificing herself for Elsa, I’m pretty sure they were just using the “Scapegoat” archetype, rather than promoting a Christian agenda. Remember how there was a woman who thought “Let It Go” was secretly trying to turn kids gay? That REALLY wouldn’t line up with a secret Christian agenda! Still, though, the ultimate Scapegoat in history is Jesus, so it makes sense that you made the connection.